DEEP INTO THE BEKAA is a simulation depicting the first T-72 and Merkava tank battles in the final stages and hours of the Peace for Galilee Israeli offensive in 1982. These tank battles were the largest of the war and occurred as both sides sought to position themselves before the ceasefire at noon. They began at 10 a.m. as the Israeli Merkava tanks moved deep into the Bekaa Valley from their 77th battalion and the 409th Anti-tank (TOWs on Jeeps) swept far to the north until both collided with the fresh Syrian T-72 tanks of the 82nd Brigade, 3rd Armor Division. As soon as elements of the Merkava tank battalion arrived, Syrian T-72 tanks began to fire from a distance of 2500-3000 yds. The Israelis inched ever closer to the Syrian border and in desperation, Syrian Milan AT units and Gazelle TOW gunships began to appear. To the Israeli, the going was a cautious advance yet one that had to achieve the most territory before the agreed ceasefire at Noon. The battle is unique for it was the first time the new Russian T-72 tank faced off with the new Israeli Merkava, for both their debut in battle. Units represent single AFVs, helicopters or infantry AT teams. Each hex measures 324 yards from side to side. Each turn represents 5 min. time. Robert VanDormolen 10 10 10 Have not played it yet, but I looked it over. 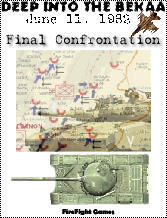 Looks like an interesting modern wargame to play.